Illicit trade in tobacco products undermines global tobacco prevention and control interventions, particularly with respect to tobacco tax policy. From a public health perspective, illicit trade weakens the effect of tobacco excise taxes on tobacco consumption - and consequently on preventable morbidity and mortality - by increasing the affordability, attractiveness, and/or availability of tobacco products. Furthermore, tobacco illicit trade often depends on and can contribute to weakened governance. This week at the Third International Financing for Development Conference in Addis Ababa, we’ve seen the birth of a new era in global health financing. The World Bank Group, together with our partners in the United Nations, Canada, Norway, and the United States, just launched the Global Financing Facility in support of Every Woman Every Child. It’s hard to believe it’s been less than 10 months since the GFF was first announced at the 2014 UN General Assembly by World Bank Group President Jim Yong Kim, UN Secretary-General Ban Ki-moon, Prime Minister Stephen Harper of Canada and Prime Minister Erna Solberg of Norway. We’re grateful to the hundreds of representatives from developing countries, UN agencies, bilateral and multilateral development partners, civil society and the private sector who have contributed their time, ideas, and expertise to inform and shape the design of the GFF to get it ready to become operational. This week in Addis Ababa, Ethiopia, during the Third International Financing for Development Conference, the United Nations, along with the World Bank Group, and the governments of Canada, Norway and the United States, joined country and global health leaders to launch the Global Financing Facility (GFF) in support of Every Woman Every Child. Partners announced that $12 billion in domestic and international, private and public funding had already been aligned to country-led five-year investment plans for women’s, children’s and adolescents’ health in the four GFF front-runner countries: Democratic Republic of the Congo, Ethiopia, Kenya and Tanzania. This week (August 1-7) is World Breastfeeding Week, an occasion to remind ourselves of the important role that optimal infant and young child feeding plays in the healthy growth and development of individuals, communities, and nations. For more than 30 years, the World Bank has championed the importance of breastfeeding. This includes investing in advocacy and communications to policymakers, strengthened health systems, and effective community-based outreach to provide the knowledge and support needed by women and their families. What are the health benefits of breastfeeding? Breastfeeding is one of the most powerful tools available to a mother to ensure the health and survival of her child from the moment he/she is born. Optimal breastfeeding practices, which include initiating breastfeeding within an hour of birth, feeding only breast milk until 6 months, and continuing to breastfeed up to 24 months, are key elements in the fight against malnutrition. Breast milk provides all the nutrients a child needs for healthy development in the first six months of life. And the antibodies that are transferred from a mother to her child during breastfeeding help protect infants against common childhood illnesses that can lead to death, such as diarrhea and pneumonia. The Lancet’s 2008 series on Maternal and Child Undernutrition has estimated that the relative risk of death (all cause mortality) is 14 times higher for a child who is not breastfed versus one who is exclusively breastfed. When broken down by disease, the relative risk of death from diarrhea and pneumonia is 10.5 and 15 times higher, respectively, for children who are not breastfed versus those that are exclusively breastfed. Le 11 juillet, lors de la Journée mondiale de la population, des acteurs mondiaux de premier plan dans le domaine de la santé se réunissent à Londres pour tenter de mettre la priorité sur l’enjeu de la planification familiale. Cet enjeu est au cœur des travaux du personnel de la Banque mondiale chargé des questions de santé en Asie du Sud, qui s’emploie à trouver les moyens qui lui permettront d’aider plus efficacement les femmes et les familles à espacer les naissances et à éviter les grossesses non désirées. Même si les pays d’Asie du Sud ont progressé dans l’élargissement de l’accès à la contraception moderne et dans le recul global de la natalité, la région accuse la deuxième plus forte mortalité maternelle du monde. Dans ces pays, les ménages pauvres, marginalisés et non instruits n’ont pas accès aux services de santé génésique dont ils ont besoin, et notamment à la planification familiale. En Inde, au Népal et au Pakistan en particulier, les taux de fécondité et d’utilisation de contraceptifs diffèrent considérablement d’une catégorie socioéconomique à l’autre : en Inde, alors que le taux de fécondité n’est que de 1,8 chez les femmes les plus aisées, il se maintient à 3,9 parmi les plus démunies. Au Népal, les femmes instruites ont, en moyenne, 1,9 enfant, contre 3,7 pour les femmes non instruites. Au Pakistan, la prévalence de la contraception atteint aujourd’hui 32 % chez les couples riches et seulement 12 % chez les couples pauvres. En Inde, dans l’État du Meghalaya, 36 % des couples désireux de recourir à la planification familiale n’ont pas accès à une contraception efficace. El 11 de julio, Día Mundial de la Población, mientras los líderes mundiales de la salud se reúnen en Londres para debatir sobre el otorgamiento de una mayor prioridad a la planificación familiar, el personal del Banco Mundial que trabaja en el sector de salud en Asia meridional estará pensando en cómo respaldar más eficazmente a las mujeres y las familias de esta región para espaciar los nacimientos y evitar los embarazos no deseados. Aunque los países de Asia meridional lograron aumentar el acceso a la planificación familiar moderna y reducir los índices totales de fecundidad, la región sigue teniendo la segunda tasa más elevada de mortalidad materna. Los hogares pobres, marginados y sin educación no cuentan con los servicios de salud reproductiva que necesitan, incluida la planificación familiar. En India, Nepal y Pakistán, en particular, las diferencias en la fertilidad y el uso de anticonceptivos entre los grupos socioeconómicos son sorprendentes: en India, la tasa de fecundidad en la parte más rica de la población es de 1,8, mientras que sigue siendo de 3,9 entre los más pobres; en Nepal, las mujeres con educación tienen en promedio 1,9 hijos, mientras que las menos educadas tienen un promedio de 3,7; en Pakistán, la prevalencia de anticonceptivos es del 32% en las parejas más ricas y de apenas el 12% entre las parejas pobres, y en el estado indio de Meghalaya, el 36% de las parejas que quiere practicar la planificación familiar carece de acceso a métodos anticonceptivos eficaces. On July 11, World Population Day, while global health leaders meet in London to discuss giving greater priority to family planning, World Bank health staff in South Asia will be thinking about how to more effectively support women and families in this region to space births and avoid unwanted pregnancies. While the countries of South Asia have made progress in increasing access to modern family planning, and reducing total fertility rates, the region still accounts for the second highest burden of maternal deaths. Poor, marginalized and uneducated households do not have access to the reproductive health services they need, including family planning. In India, Nepal and Pakistan in particular, the differences in fertility and use of contraception across socioeconomic groups are striking: In India, the fertility rate among the wealthiest part of the population is only 1.8, while it remains 3.9 among the poorest. In Nepal, educated women have on average 1.9 children while the least educated have an average of 3.7.In Pakistan, contraceptive prevalence is 32% among wealthier couples and yet only 12% among poor couples. In the Indian state of Meghalaya, 36% of couples who want to practice family planning lack access to effective contraception. Malnutrition in South Asia is the worst in the world (yes, worse than that of sub-Saharan Africa). It undermines the efforts of countries to reduce poverty, increase educational attainment and productivity, expand innovation and entrepreneurship, and reduce maternal and child mortality. 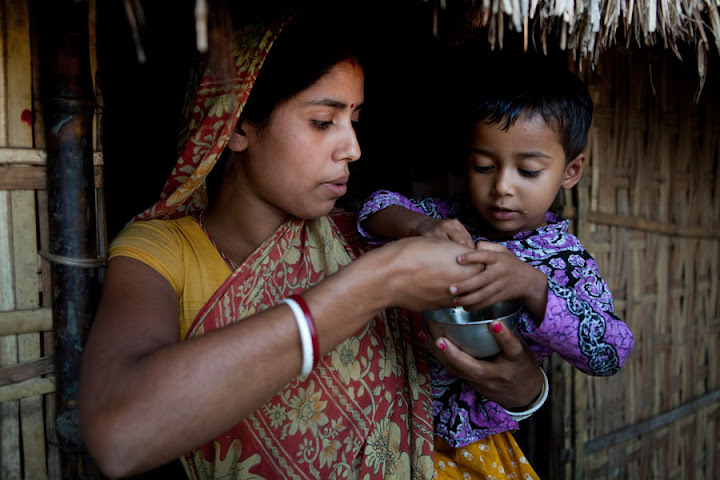 It’s also why, for the past two years, 21 organizations from India, Nepal, Afghanistan, Pakistan, Sri Lanka and Bangladesh have implemented community-based innovations for improving infant and young child nutrition, financed by a unique World Bank small grants initiative known as the Development Marketplace.